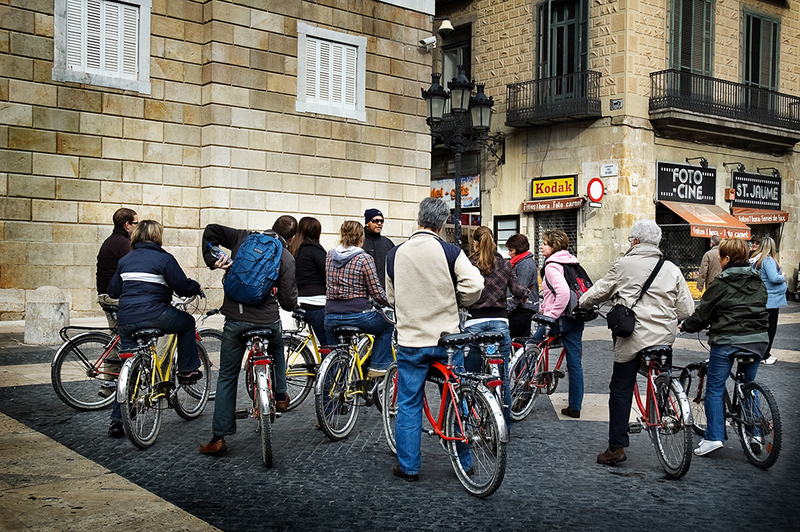 I spotted this group of people on a guided bike tour around the city of Barcelona. In Sant Jaume square the tour guide was explaining something to them before getting lost in the labyrinthic structure of Barri Gotic streets like carrer del Bisbe which can be seen in the background. Normally there are set meeting points to go and join. It costs a little over 20 EUR. I have done this tour. One of the funniest things was when he took group photos. He would take everyones camera and then half an hour later we would be able to get going!! I wish I had a DSLR back then. I would love to do that! You see-this is why Americans are so out of shape. That was a funny comment above mine about the tour guide holding up the tour to get all the photos! This is a great idea! When I visit Barcelona in the summer, I will definitely be doing one of these tours. Carlos, te veo un poco perezoso eh? y eso que te lo digo yo! Pero bueno, mucho ánimo para el 2009, espero que no hayas empezado ya con la cuesta... un saludote! What an eco friendly, healthy way to see your wonderful city.